Fresh & Easy Neighborhood Market Inc., 5/6 -- Extra savings on chicken breasts when you use your Made for Me coupons! 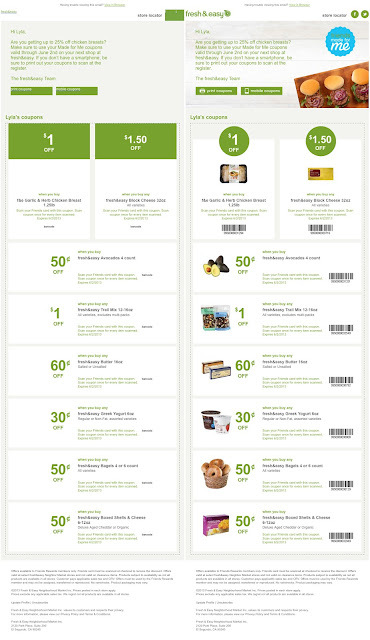 Fresh & Easy has one of the better customer rewards programs I have encountered. Unlike some grocery retailers, their Made for Me coupons are genuinely tailored towards the user (not merely configured with whichever products might be on promotional special that week). Indeed, I have previously purchased every product featured in this email, and Fresh & Easy is subtly reminding me that I haven't been using my coupons. In my haste, on a recent shopping trip to my local store, I forgot to scan the coupons from my F&E app. This reminder email uses data to dynamically populate the subject line and body copy with an item of which I could have received savings. It's an added bonus that this email looks almost as good with the images disabled, as it does with them turned on. Snapfish, 5/6 -- Last chance! FREE overnight shipping for Mom's Day | 3 print deals! Virgin America, 5/6 -- Mother's Day Offer: Earn 15 Elevate points per $1 spent with FTD. The Container Store, 5/6 -- Now arriving...Our Go Organized Travel Sale! Anthropologie, 5/6 -- Work it: why we love a blazer. Target.com, 5/6 -- 20% off your $99 purchase + head-turning work outfits. CHEFS, 5/6 -- What makes Vitamix special? 1-800-FLOWERS.COM, 5/6 -- Free Roses, Free Vase & Free Chocolates for Mom!